June 4, 2018 5:00 P.M.
Also present were Rich Simon – Director of Public Works, Dustin Bedore – Director of Electric Utilities, Alex Weis – Code Enforcement, Brian James – Fire Chief, Mary Volk – City Clerk, and Andrew Finzen – City Manager. 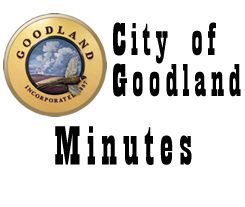 Chris Smolik: Goodland Regional Medical Center – 1. Chris stated, I would like to remind Commission of the Grey Hound Bus issue. Both neighboring communities had police and health issues from the bus stopping in community and have passed an ordinance that does not permit them to stop in community unless they have a ticket station. It has caused a health and safety issue for hospital and law enforcement. I would support it if they put in a ticket agency. It is about public health and safety. I realize it affects a local business, but he was in other communities also. Burton Pianalto, Sherman County Sheriff stated, I would like to be a part of discussion as the bus is a cost to this County. I have been giving a lot of thought about parking ordinance. I meet monthly with the college and school district, major employers of community. We face a housing issue. From a hospital stand point, we are bringing in higher end professionals, with the small housing inventory, or if there is a nice house, the neighbor’s house is a nuisance and reduces resale value. A comment for future generations, if we want our community to remain viable long term, I do not know that the parking issue is as great to professionals as enforcing how properties are maintained. Everyone has different socioeconomic and financial situation, but the issue is the vehicles on property that do not run and need to be hauled off and property maintained. I have hired employees from neighboring communities but for them to move here after they are hired, housing is an issue. James Carver – James stated, I am here to discuss grain piles on edge of town. Since the piles have been brought further north I cannot have a picnic in my yard with the grain dust and particles floating in the air. What can be done about it? It is ruining my house and yard. I am nervous rats and mice will follow. Mayor Linin stated, have you talked to them? Kelly Rippe citizen stated, I own a business across the street and have had to go home because of same issue. James stated, health issues arise from grain dust. Connie Grieve, citizen stated, the dust has gotten considerably worse. It is fogging the area for a number of blocks. Jeff Gray, Kansas Department of Agriculture stated, if you want to talk to me after the meeting, I have some ideas for you on the dust. Connie Grieve – Connie asked, is there an ordinance to deter trash dumpsters in alley? Our dumpster is tilted back on our fence. Mary stated, if you would contact City Office we will work with you to get situation resolved. Connie stated, I would like to thank you for fixing intersection at 11th and Center. ON A MOTION by Commissioner Garcia to approve Consent Agenda seconded by Vice-Mayor Brumbaugh. MOTION carried on a VOTE of 5-0. Ordinance 1713: Sewer Rates – Andrew stated, ordinance is a result of discussion at May 7th The consensus was to adjust residential rates from base/consumption to flat fee of $14.00 then for commercial accounts adjust the base to $8.00 and consumption rate to $1.75 per 100 cubic foot. As discussed, there is an incremental $.20 cent increase per year effective January 1, 2020, if needed. The new rates are in effect July 31, 2018. Vice-Mayor Brumbaugh asked, were there contingencies built into the budget for the rate increase? Andrew stated, yes and if additional monies, will transfer to reserve. Vice-Mayor Brumbaugh asked, can we shift excess budget down? Andrew stated, we are actually budgeting more expenses than revenue we are receiving. Commissioner Garcia asked, you still planning on this providing $150,000 additional revenue each year? Andrew stated, yes. Vice-Mayor Brumbaugh stated, in evaluating information, if incremental increases had been addressed over the years, the rate would be at this same place. Commissioner Garcia stated, we need to inform people how the new rate compares to our neighboring communities. Andrew stated, in comparing to our neighbor’s, our new rates are still substantially lower. ON A MOTION by Commissioner Fairbanks to approve Ordinance 1713: Sewer Rates seconded by Commissioner Schields. MOTION carried on a VOTE of 5-0. Resolution 1528: Unfit Structure 1302 Kansas – Andrew stated, Resolutions 1528 and 1529 set public hearings for July 16th for the property outlined in each resolution. Alex stated, one property was complaint driven and the other was damaged by a fire. ON A MOTION by Vice-Mayor Brumbaugh to approve Resolution 1528: Unfit Structure 1302 Kansas and Resolution 1529: Unfit Structure 1116 Caldwell seconded by Commissioner Fairbanks. MOTION carried on a VOTE of 5-0. Resolution 1529: Unfit Structure 1116 Caldwell – See item B above. Board Appointments: CABT – Andrew stated, applications were discussed at last meeting and I recommend approval of appointments of Michael McClure as the plumbing representative, Charles Baker as the commercial contractor representative, Randy Topliff as the residential contractor representative, Zachary Lohr as the electrician representative, and Stacy Owens as the member at-large to the Construction Advisory Board of Trade’s/Appeals Board. ON A MOTION by Commissioner Garcia to approve the Michael McClure, Charles Baker, Randy Topliff, Zachary Lohr, and Stacy Owens to the Construction Advisory Board of Trade’s/Appeals Boardseconded by Commissioner Schields. MOTION carried on a VOTE of 5-0. Budget Workshop Scheduling – Andrew stated, we need to schedule the Commission budget workshop, our preference is a day time meeting but need to get boards and Department Heads scheduled for meeting. Commissioner Fairbanks stated, June 25th works for me. Commissioner Garcia stated, the 25th is questionable for me. Commissioner Schields stated, I prefer a morning meeting. Vice-Mayor Brumbaugh stated, either morning or evening meeting. Mayor Linin stated, I recommend two evening sessions. Consensus is to schedule the meeting for June 25th and 26th at 5:00 p.m.
Off-Street Parking and Standalone Garage Ordinances – Andrew stated, this is the third discussion on this ordinance; there are still changes that need to be done before any formal action. There have been two different drafts as discussions take place. Provisions in the current draft are no parking any vehicle between the curb line of the street and the principal structure except on all-weather improved parking surface of gravel, stone, brick, asphalt, concrete, or dirt if no wider than the driveway approach. This draft pertains to vacant lots. No more that 50% of front, rear or side yard are used for parking and not more than seven vehicles parked on the lot. During the last discussion, Commission wanted to add garage modifications on vacant lots to ordinance to possibly increase concealed parking and ease some concerns with parking requirements. I have not added garage modification into ordinance as I want to understand what Commission desires in ordinance. I want to prevent a lot of metal buildings being built in the City. Current code requires a garage to be an accessory structure, subordinate to principal use, not cover more than 12% of total lot area with a maximum of 1,200 square feet, and no more than 16 feet to the peak of the roof. Proposed modifications for garages are to allow a “standalone” construction of a garage on vacant lots if applicants submit a site plan to demonstrate the garage will not prohibit future construction of a house on lot. In addition, maintain the 12% coverage with a maximum of 1,200 square feet restriction, and develop aesthetic/exterior building material standards. For example in a C-2 district, a minimum of 50% of each exterior wall shall consist of one or more of the following materials: masonry, brick, stucco or glass. Vice-Mayor Brumbaugh stated, I think we need two ordinances, one for residential parking and one for garages, but I feel vacant lots should be included in the with garage ordinance. I feel there are issues with vacant lots which deal with the garage ordinance. Mayor Linin stated, the floor is open for public comment. In the interest of keeping order, each presenter is limited to two minutes each and I would ask that you speak to the Commission, not each other. Minh Huynh citizen stated, I feel it is a good idea not to have vacant lots, there needs to be a structure of some sort. I agree some people want to have a shop, but do not agree with all requirements presented because of the cost. The limitation of 1,200 square feet is good, but what if they want to do vinyl on exterior? There are many types of material to use for exterior. I hope there is no restriction on foundation because sometimes it is not needed. James stated, I have a vacant lot but if I want a metal building it would not be allowed by this. I cannot afford brick. Minh stated, I am on same page, a building on the lot is better than the vacant lot. Randy Raile stated, my only issue is I own property at 323 and 307 Broadway. I keep them mowed and maintained but I need to point out issues at entrance to City. There are properties at each entrance that need addressed more than where my vehicle is parked. I have been riding around town with people from out of town and there are a number of properties where people reside but the property is run down. I mow and pay my taxes; you need to address those that do not pay taxes or mow and let their property get run down. Sherman County has gotten really bad with nuisance properties in the last year. Cliff Bostwick citizen stated, I understand the main purpose is to keep Goodland looking good and I am in support of beautification, but the cost to pave driveways is expensive, even if you do work yourself. Water runoff from paved surfaces goes into sewage system. The inadequate drainage system creates a puddle in my driveway already. There is structural material that will absorb water better, even grass keeps it from going in sewage system. Simply tearing down houses does not do anything for this town. Driveways collect oil and it drains into our sewer system. Gary Farris citizen stated, this issue has opened a big can of worms like three mile zoning. I am being told my lot would be considered a salvage yard if I did not move vehicles. These is a lot of junk in this town and many cannot afford to do anything about it. There are a lot of hoarders in this town. You have to go slow. As far as I am concerned it is fine to park on your own property. Dean Graber citizen stated, Andrew sent me the proposed ordinance which was disturbing but it was different than copy proposed today. It becomes difficult when you prohibit people from putting up a building on property they have cleaned up. If purpose is to clean up city, need to concentrate on current nuisance ordinances rather than making a new one when it is their property. They should not have restrictions on parking when it is their property. My opinion of proposed ordinance is to scrap it. If someone has a complaint on a property it needs to be brought in and investigated. Taking more control of property rights tends to upset people more than needed. Commissioner Fairbanks stated, I want to make sure everyone understands this has been a discussion item, it was never intended for the Commission to vote on ordinance tonight. We appreciate your input. Dean stated, if nothing else, you need feedback which you are receiving tonight. Todd Trzcinski citizen asked, is this going to affect commercial property? Mayor Linin stated, it is not intended for commercial, only residential property. Andrew stated, the first draft did not distinguish that fact but it is clarified in proposed draft. James asked, what about a residence on commercial property. Mayor Linin stated, this has been a work in progress for us for a while. Todd stated, I take pride in my property. I started my business in the back of my residence but my neighbor’s did not agree to location so I found a commercial location and take the time to keep it maintained. Bobby Jo Doyle citizen stated, I own two lots at 3rd and Main and Center. If I take my fence out I cannot park there because it is not the right surface even though I have no curb on property. A lot of properties are still being fixed from hail storm a while back, why not enforce that instead of where people park on their property. Walter Darnell Jr. citizen stated, I realize the ordinance is in draft form, but I like the option of a dirt drive. Clifford stated, I spoke with Schlosser Concrete, they do not carry gravel smaller than the ¾ gravel so for them to order it in, the gravel it will be three times more expensive since it will be a special item. Minh stated, everyone has talked about price, not everyone has same income. I like to have things nice, but this is a subjective topic. Safety is an issue, some families live two to three families per home so have more vehicles than allowed so will have to park in street, which promotes other problems. We are not a Home Owners Association. The Commission should be using this time to focus on other topics, like school shooting safety or other funding of police training on school shooting. I feel you need to scrap ordinance and address something more meaningful, like safety. Should be using time for something more positive. I want things to look better. What about grants to assist people to subsidize improvements. You need to be discussing commerce and getting more people to come to our community. Jeff Stodola citizen asked, where did this ordinance come from? I cannot afford to concrete anything like this. This is a big city ordinance. Andrew stated, nothing in the proposed ordinance is unique to Goodland community, but drafted from ordinances from other communities of same size. Jeff stated, who will enforce this when people cannot afford to clean up properties? Andrew stated, the Code Enforcement Officer when he drives town, but it is also complaint driven. Jeff stated, if you want us to pave you need to provide assistance. This is a City not a gated community. You are regulating our private property. I do not see a problem with a metal building or a Tuff Shed from Home Depot. Kim Phillips citizen stated, everyone is on a fixed income, if they cannot afford to fix air conditioning, they cannot afford to pave drives. Many citizens here have cars as a hobby and have more than seven cars. The car show brings a lot of money to this town, why would we want to put on show if you are not going to stand behind us? I feel this ordinance is picking on a certain group of people. The Commission needs to address dust and bugs from grain instead of picking on those that have cars for a hobby. Instead of a new ordinance you need to enforce ordinance on the books to maintain properties. The 1,200 square feet requirement on garages would depend on the size of the lot. The height restrictions will cause another problem. I feel the proposed requirements are too confining. Allan Langness citizen stated, I feel the proposed restrictions for a garage are too restrictive, especially with my current property. I would like it higher, like eighteen feet to build a loft in my garage for storage and cannot with sixteen foot restriction. Mrs. Lyle Kimminau citizen stated, I have worked hard on my property and I do not care how many cars my neighbors have, they do not care how many I have. I am on a limited income but try hard to make my property nice. We put up a car port but we cannot afford to pave the area. What are you going to do to me if I do nothing to comply? My neighbor’s do not tell me what I need to do and I do not tell them. The Commission needs to focus on cleaning up this community rather than parking. Drive by my property at 9th and Syracuse. Joe Schaffer citizen stated, we should not have to pave drives, even on rentals. Matthew Ries citizen stated, no one supports this bill, the vote is going to be no. I agree with Minh, you need to focus on other issues. You should focus on cleaning up properties. Shawnee Schields citizen stated, I have grown up in Goodland, this proposal affects more people than it was intended to. I do not like people parking in their front yards but this ordinance steps on people’s feet. I am glad to see Commission is looking at allowing buildings on vacant lots. I would like to see boats and campers taken out of proposal. I am happy people can have them but they do not look bad. Kelly Rippe stated, I am 100% in favor of this ordinance. If you want to know why, come to my neighborhood and see. You all take care of your property but not everyone does. It is not intended to attack or make you spend money you do not have. I would like to see our town cleaned up, it has gotten really bad. I invite everyone to look at my neighborhood. Lydia Garcia citizen stated, we try to clean our property up but my neighbor to west has part of my property, what do we do? Look at the exits, nothing is on one while there are some things on other exit. We need to work together to beautify yards, there are cats galore. Connie Grieve stated, I support what Kelly said, I appreciate people cleaning up their yards. I understand when you have more than one family in a home, just need to be respectful. I appreciate the hobbies but do them in the back yard. As far as vacant lots, work on restrictions. Matthew stated, who do we talk to about setting up a community group to help other people? I am willing to help the community. Commissioner Fairbanks stated, it is a good idea and is something you can organize. This commission has worked hard to clean up properties. If we find a happy medium on this issue, we hope you will stand behind us as I am hearing you as a group would like community cleaned up. We are elected to support you and need to hear what you have to say. That is when we become better commissioners. You need to voice your opinions but you also need to support us on our efforts. Vice-Mayor Brumbaugh stated, I am brain storming what do about people not able to clean up property. I am looking at local organizations that could sponsor the group for a year and focus energy to cleaning up community. Matthew stated, I want to see community come together and look good. James stated, if you enforce current ordinances it would speak louder to citizens. Mayor Linin stated, generally I would say yes but we do not have an ordinance specific to this issue. James stated, I just do not feel someone should tell me how many cars I can have or where to park on my property. There are ordinances for some of the nuisance items that we need to focus on. Making a law when people cannot afford it is not the answer. Linda Romero citizen stated, Mathew was talking about helping people mow, several years ago the community had a soup bowl idea, need to do something like that to help people. Many cannot financially or physically afford this ordinance. Quigg McCombs citizen asked, I have buffalo grass on corner lot, can I keep vehicles parked on it? I keep property mowed. Mayor Linin stated, the way proposed ordinance is written today you cannot, but we are open to idea. That is why we are discussing this issue. Connie Nelson citizen stated, I have two things, we have buffalo grass on our commercial lot and keep it mowed. With a good stand of grass it helps keep out the weeds. Also on parking for special events like the fair, the ordinance I saw would not allow for leniency at special events. Dave Hageman citizen stated, it is about the message we are sending our children. I have a car hobby and to some cars and car parts are junk but to me they are art. My children build and race cars. It is our love and life. I will leave the frames in my yard until I get a ticket. The message to our kids has to be about their imagination. This has to be for our kids and how we go forward as a community. Every individual has personal rights. Starla Kennedy citizen stated, what about the four unpaved streets in town and the pot holes on those streets? Derby cars are our hobbies. The seven car rule is difficult. I get both sides, but let’s work on our unpaved streets. Dylan Glover citizen stated, I agree with Minh, other things need to be addressed first. This ordinance does not address commercial property but what do we see when come into town? They are a nuisance. Mayor Linin stated, this ordinance is directed to residential, there are other ordinances that relate to commercial property. Dylan stated, it is making it difficult for residential property owners when neighbor’s live out of town and do not care what their property in Goodland looks like. A lot of commercial businesses have a lot of dead cars just sitting around but nothing is done. I would like a place to park our boat and trailer. Bobby Jo stated, instead of making this rule, when are you going to put in arcades and activities for our kids? Shirley Raile citizen stated I have lot at 323 Broadway that I keep maintained with a good stand of buffalo grass and would hate to see us have to take it out and replace with pavement. Bobby Smith citizen stated, I work in Colby, you want to beautify the town but there is no light on that flag to the entrance to town. Total disrespect for us veterans, I demand a light on that flag. Commissioner Garcia stated, I would like to thank the citizens for coming out and bringing ideas forward. Commission will take under advisement and continue discuss issue. Mayor Linin stated, so you know how local government works. This discussion is about an ordinance that is or is not approved by the Commission, it does not go to a public vote. The citizens vote for the Commission to represent their needs. It is important to remember there are a lot of citizens in Goodland that have not come in to speak, that also have an opinion. Jack Craven citizen stated, if the Commission votes on issue, why not send letters out to inform people, see if people want this ordinance. There are more issues that need to be addressed for safety. Starla asked, are your meetings public? Mayor Linin stated, yes regular meetings are first and third Monday of every month at 5:00 p.m. We do have special meetings but they require a call notice. Andrew stated, the unfortunate aspect of City Government is that we typically only see people against issues. Mayor Linin stated, I would like time to think about what has been said before we proceed. City Managers Report- 1. The pre-construction meeting for the street project is next week. We plan to start construction in July. 2. The pool opened May 26th and has been running fairly smooth. Barb Bedore has been able to conduct lifeguard training in house instead of sending guards to Burlington. Bicycle round up was the end of May, had a good program. 4. Moving of the KDOT building to Wilkens Truck and Tractor is scheduled for Thursday. It was postponed because of weather. We will keep Commission informed. 5. Received good feedback on cemetery over Memorial Day. Public Works Director – Rich gave Commission an update of projects the departments are working on. Vice-Mayor Brumbaugh – 1. Throughout the comments tonight, the theme is to clean up the community. We have people passionate about getting something done to clean up Community. Living in town you give up some rights as the nuisance cannot be at the expense of someone else’s rights. Your home is your most valuable asset. The hospital is bringing people in that are looking at homes but there are not many to choose from or they do not like the neighborhood. There has to be a balance to make it better and bring everyone together. We do not need to hurry it, we need to keep listening and talking to citizens. Commissioner Fairbanks – 1. I appreciate comments from the citizens. We do not know what people think unless you attend meeting. I feel some took offense to ordinance when they are working hard on their property. It is the people that do not take care about their property that we are concerned about. It will take some work to get ordinance where we need it. Everything cannot continue to be junk around town. Brian James stated, my thought on this is can we make this complaint driven? A good example is the campers at 15th and Caldwell where there is nothing we can address with them, but the neighbors are submitting complaints. Commissioner Fairbanks stated, I understand but then you get them pointing fingers about a different property that we have not addressed. We have to work together; Alex does a good job. Andrew stated, the clarity of our code is a problem with enforcing code. 2. The light on flag has been running, is it burned out? Dustin stated, we unhooked it to move building but it was delayed. The flag has been taken down now and will go back up when light is hooked up. Commissioner Garcia – 1. We have to put a lot of thought into how we draft this ordinance; there were some good points made by citizens on vacant lots. I feel we need two separate ordinances for the information. Commissioner Schields – 1. I appreciate citizens coming to meeting to voice concerns as they have to tell us what they are thinking. There is a lot of work that needs to go into drafting this ordinance. My personal preference is that I do not like people parking in front yard. They do not understand we are working hard to clean up community. 2. It is important that our employees know they are doing a good job for the City. Mayors Report – We received a lot of feedback from citizens but the shining star is that this has been an opportunity to communicate with citizens and let them know they have an open door to voice concerns. The reality side for a community group is they typically do not work, look at the park equipment project. Local government sets minimum standard but the most powerful tool is our community. Pride is sometimes the piece that is missing. Change is hard and our community did not get to this state overnight. Commissioner Fairbanks stated, I want to thank Andrew for the work to get ordinance to this point. Mayor Linin stated, I feel we cannot over communicate on the issues to the public to help answer some questions. I encourage everyone to think about what was discussed tonight. It will be a difficult issue if we are not unified. ADJOURNMENT WAS HAD ON a MOTION Commissioner Garcia seconded by Vice-Mayor Brumbaugh. Motion carried by unanimous VOTE, meeting adjourned at 7:40 p.m. Next meeting is scheduled for June 18, 2018.